How to draw Tenten from Naruto Manga. Tenten, テンテン, is one of the main supporting characters of the series. She is a chūnin-level kunoichi of Konohagakure and member of Team Guy. 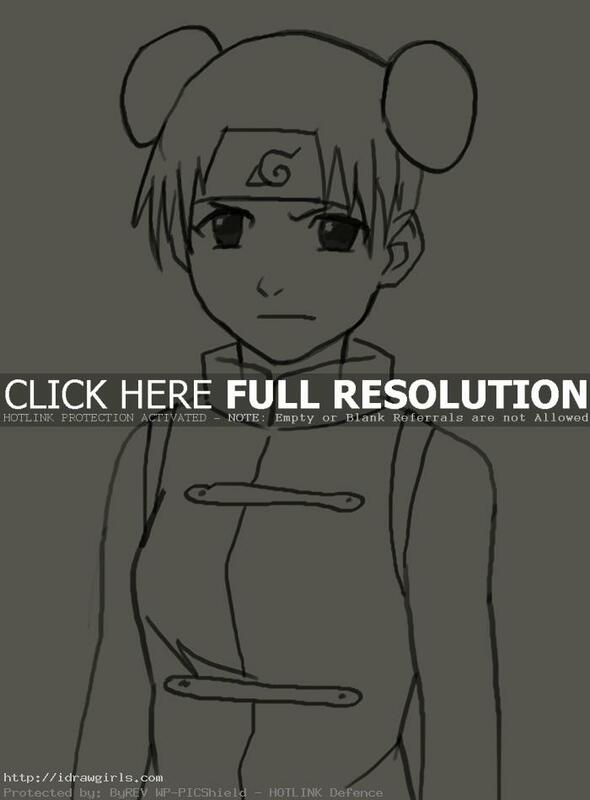 Learn how to draw Tenten step by step basic Manga drawing lesson. Learn basic drawing and sketching technique for Manga, Anime and comics from TheArtClasses.com In this tutorial you will learn to draw an Manga character Tenten along with basic drawing tips and technique. First, you can use simple geometry shapes to construct the basic Manga head and body. It will make your drawing process a lot easier once you get the shape and proportion right. You also have to make sure the shape of eyes, nose and mouth are correct. Also remember to put each element in its correct spot. I usually start of using sphere or circle as a base for character’s head shape, then next step would be figuring out the next basic shape to fit into the image. Tenten strongly believes that female shinobi can be as strong as male shinobi. During the Chūnin Exams, Neji suggests that kunoichi aren’t good at taijutsu, but Tenten reprimands him, explaining that girls are just as good as boys when it comes to taijutsu. Tenten’s personal dream is to become as powerful and well noted female ninja as Tsunade. She can be quite fierce sometimes, especially with Lee, violently shaking him whenever he is left unconscious, Naruto also describes her personality as fierce and scary. Here is a final drawing of Tenten from Naruto. 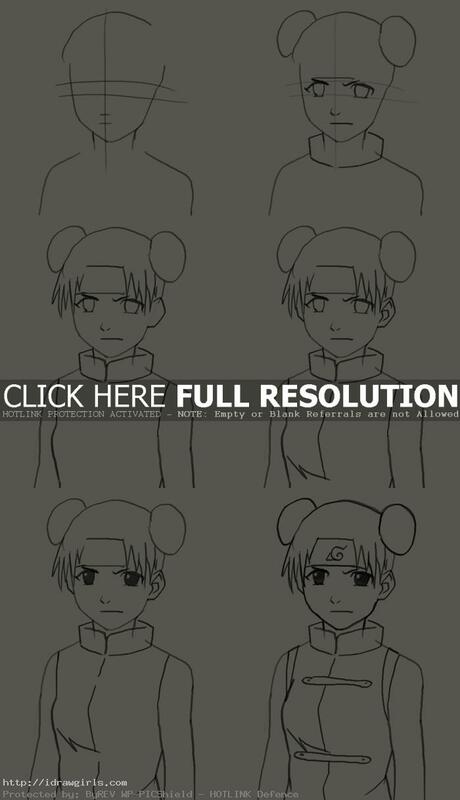 Below are step by step images how to draw Tenten. First, I started drawing her head shape, shoulders and guidelines of her face. Step two, I drew her eyes, nose and mouth over the guidelines shown below. Step three, I drew her hair style with two buns and both side bangs. Step four, I sketched out her arm and sleeveless shirt. Step five, I finished the rest of her upper body. Step six, I added her headband and finished the rest of her costume design.